Cucumber Salsa is another delicious recipe from my friend Di. You must try her Monster Cookie Dough Dip and I promise you her Chicken Salad is amazing! This recipe is perfect for using up a bumper crop of cucumbers or just to grab a few cucumbers from the store when you need a bite of summer. Friends will love this fresh zesty salsa. Chipotle Rotel, cucumbers, ranch dip mix, garlic, and vinegar come together to make a delicious salsa. It is hard to believe such a few ingredients create this fresh salsa. Grab these simple ingredients and you are ready to make a great salsa. It is super easy yet super delicious. Mix together the following ingredients. Be sure to grab a can of chipotle Rotel to get the rich smokey flavor in this salsa. Let sit for two hours to allow flavors to mingle! 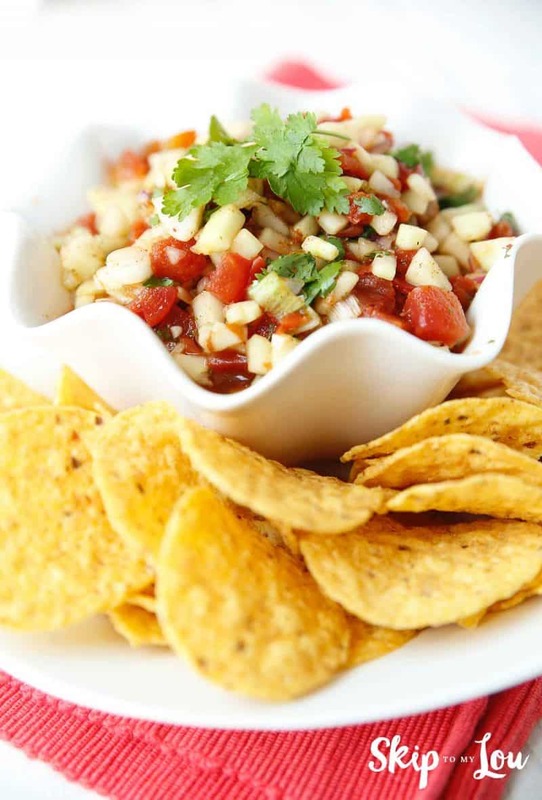 Serve this salsa with tortilla chips or corn chips. Enjoy this printable recipe below. Please let me know what you think in the comments! 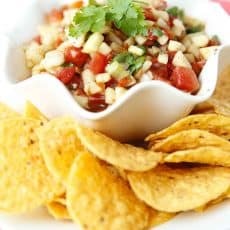 Fresh zesty salsa you will want to make again and again. Mix all ingredients. Let sit two hours. Looking for more yummy appetizers and good things to serve friends? I love this buffalo dip and this Vidalia onion dip is always a hit. Kansas Caviar is another crowd pleasing favorite. I have to say my go to quick and easy appetizer is taking a brick of cream cheese and spreading prepared pesto over the top and baking. Check out my Baked Pesto Spread. When I have a party I usually always whip up some Chex mix. Everyone loves it! Looking for something sweet? I just had a party and my friend brought her white chocolate popcorn. WOW, guests were calling for days asking for the recipe. What are your party faves? This looks so good! I totally need to try this asap!